Quickly stitch the odd-count bracelet base from the large size 8 Delicas. 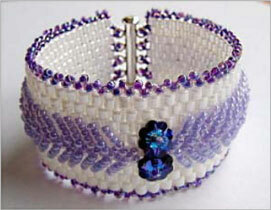 Add lovely lilac bead embroidery stitches accented with sparkling crystal Margarites. Easy 2-bead edging finishes the bracelet beautifully.